It was clear to the Parthians that the Romans would not give up easily. Since Pompey broke the treaty of friendship, the Romans had suffered three major defeats and several minor ones at the hands of Parthia. But all was not well in Parthia. In 32 BC Farhad IV's unpopularity led to a coup, supported by Rome. Farhad was driven out of Parthia by Tirdad (who ruled as Tiridates II). He issued coins, calling himself "philoromaios". Farhad soon came back, however, with help from the Saka, and it was Tiridates' turn to be driven out. Tiridates kidnapped a son of Farhad, and took him with him as a hostage when he fled to Roman Syria. He hoped the Romans would help him oust Farhad, but they weren't really interested. He tried again in 27 BC, but was expelled for good. The Romans still had his son, however. By 20 BC, Farhad IV was ready to do business with the Romans. Rome had a new government. 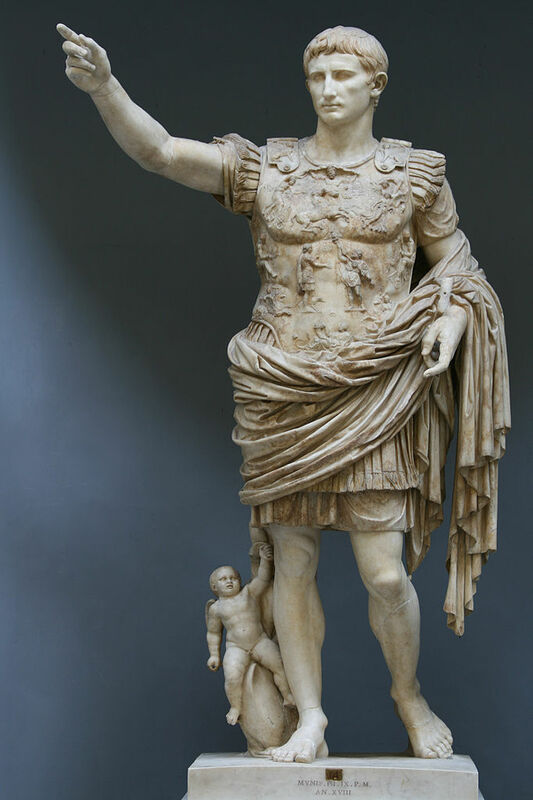 Antony's rival, Gaius Julius Caesar Octavianus (aka Octavian) in 27 BC decided he was to be called Augustus, and gave up direct control of the army (He says there were originally 500,000 troops who swore allegiance to him) - much of which was already being disbanded. He said no to expansion of the empire. He was to be simply "the first man" in Rome (princeps). Although it was a monarchy, it was still called "the republic", and power still (in theory) belonged to the SPQR - the senate and people of Rome. He had learned much from studying the success of the Achaemenids - and even imitated Darius by having copies of his achievements displayed around the empire. As for the Achaemenids, communications were important - roads were improved, a postal service like the Persians' was set up. Coinage continued to be an important propaganda weapon. Architecture was used to express the values of the regime, and religion used to authenticate it. He even attempted to establish a hereditary dynasty like the Achaemenids - something unheard of in Rome (and actually not very successful). He also understood the importance of the theatrical side of monarchy - sponsoring festivals, games, ceremonies and triumphal processions to impress the people of Rome and the empire. All backed up by the threat of force. Augustus, as Octavian, must have savoured Antony's humiliation in Parthia - especially as it made his victory at Actium much easier. He was expected to mount the definitive invasion of Parthia, to recover the lost standards and avenge the humiliations. But he decided against the military option (could he afford a fourth Roman defeat?). In 23 BC, he decided the time had come to do business with the Parthians. He sent Farhad's son back to him (the one kidnapped by Tiridates) and asked Farhad to return the Roman prisoners (many of whom he been in Parthia since Carrhae in 53 BC), and more importantly, give back the standards captured from Crassus, Saxa and Antony. I forced the Parthians to give back to me the spoils and standards of three Roman armies, and to beg for the friendship of the Roman people. This is spin - neither side had grovelled. Augustus received a rapturous welcome on his return to Rome. A new temple, to Mars the Avenger, (which was originally intended to commemorate avenging his father Julius Caesar) was built to house the standards. A thank you from Augustus! Augustus, at the same time, gave Farhad (called by the Romans Phraates) an unusual gift - an Italian slave-girl, called Mousa. Farhad promoted her to the status of most favoured wife, and she bore him a son, known as Phraataces (little Phraates). 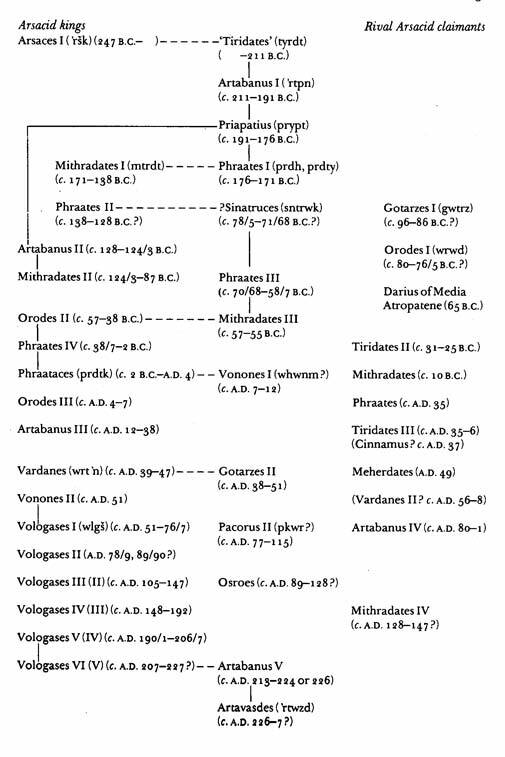 King Phraates of the Parthians, son of Orodes, sent all his sons and grandsons into Italy,to me, though defeated in no war, but seeking our friendship through the pledges of his children. And in my principate many other peoples experienced the faith of the Roman people, of whom nothing had previously existed of embassies or interchange of friendship with the Roman?people. So Augustus avoided getting involved in another attempt to "do an Alexander". The administration of the empire benefited enormously from this decision. Augustus wisely avoids military confrontation. Diplomacy restores the standards lost by three Roman armies. The Romans had lost three lots of standards: 53 BC Crassus, 40 BC Decidius Saxa (Antony's general who was defeated before being replaced by the victorious Ventidius), and 36 BC Antony. "Friend of the Romans", "Roman-lover". In contrast with philhellen ("Greek lover") which Parthian kings usually put on their coins. The origin of the word "prince" and usually translated as "emperor" - it actually means just "the first man". Augustus tried to give the impression he was an ordinary citizen - he avoided personal extravagance for example, and lived very simply. But no one was really fooled. 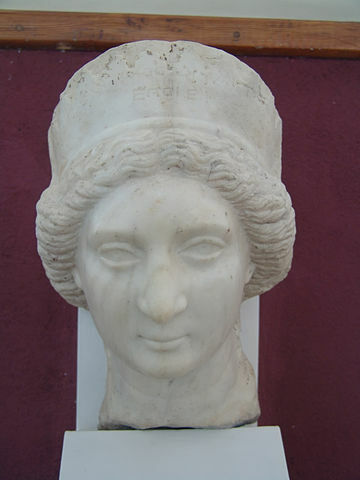 The original (lost) was on bronze in Rome - but several copies on stone have been found, the most important at Antioch and Ancyra (now Ankara, capital of Turkey). It's a very important source for Augustus' reign, although it records what he wanted to be remembered for rather than all that he actually did. Remember the daric invented by Darius as a device to unite his empire. Through his adoptive father, Julius Caesar, Augustus claimed descent from both Mars, god of war, and Venus, goddess of love. But the most significant cult was that of The Divine Julius - his father, now made into a god.